The first version of MetaModelAgent was developed for Rational Rose around year 2000. MetaModelAgent was after that completely redesigned and reimplemented for the Eclipse-platform using the EMF and UML2 frameworks. The first version of MetaModelAgent for IBM Rational Software Architect (RSA) was released in 2008 and the first version for open-source Papyrus was released in 2013. 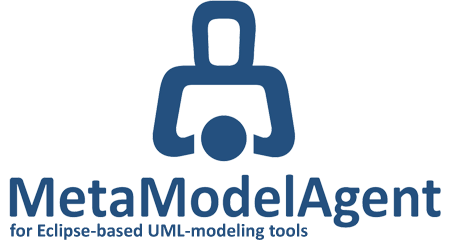 MetaModelAgent has been continually extended with more and more features and is currently a modeling tool extension for UML-based domain-specific modeling as well as for standard UML-modeling. MetaModelAgent is certified as "Ready for IBM Rational Software". MetaModelAgent can be downloaded and installed upon an existing installation of Papyrus or RSA using the update site metamodelagent.com/update, see get started for more information. Single Limited FREE and EVALUATION Licenses can be requested, and subscription licenses can be purchased, after the tool has been installed. Server-based licenses can be ordered direcly using the form at Adocus website. MetaModelAgent is developed and provided by Adocus AB, a company specialized in modeling tools and professional services within business and software modeling and architecture. Adocus is an IBM Business Partner and member of the Papyrus Industry Consortium and Eclipse Foundation.